The consolidation of newly acquired information in long-term memory is of crucial importance and sleep plays a pivotal role in this process (Karni et al. 1994, Maquet 2001, Diekelmann & Born 2010, Rasch & Born 2013). Sleep affects learning processes of bird song and human speech (Fenn et al. 2003, Derégnaucourt et al. 2005), probably through neural replays during off-line processing (Margoliash & Schmidt 2010). Bats are apt vocal learners (Esser 1994, Boughman 1998, Knörnschild et al. 2010, 2012) but Chiropteran sleep and its influence on learning processes has not been investigated in a systematic way so far. 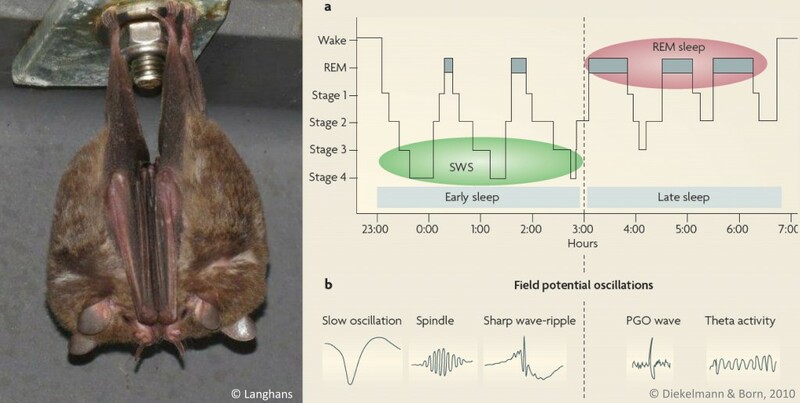 In cooperation with Dr. Karsten Rauss from the Institute for Medical Psychology and Behavioural Neurobiology at the University of Tübingen in Germany, I currently work on the establishment of systematic sleep measurements in bats to develop a classification system for Chiropteran sleep stages. Subsequently, we plan to test the influence of sleep on learning processes, e.g. the acquisition of new foraging tasks or vocal production learning.